How many times can you say "Flynndog"? Now, apparently, three. 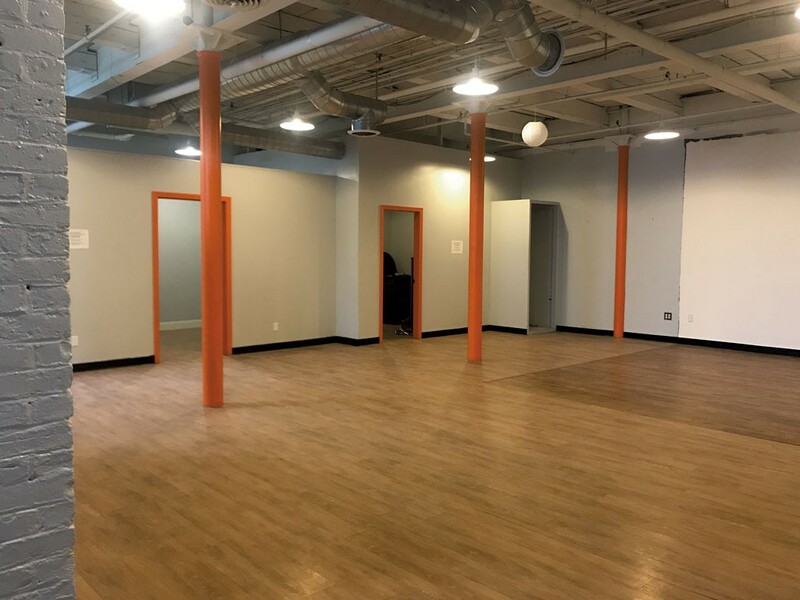 Earlier this month, Margaret Coleman, executive director of the equally furry and tongue-trippingly named nonprofit Art Shape Mammoth, leased a 1,300-square-foot studio at 208 Flynn Avenue in Burlington, adding the newly minted Flynndog Station to the mini-empire of creative spaces in the South End complex. For almost 20 years, 208 Flynn Avenue has been the home of Flynndog, a hallway gallery space that breathed new life into what had been most recently a paper roll warehouse. Last October, Coleman, who became the curator of Flynndog in 2017, took over a vacant office adjacent to the gallery and created Flynndog Project Space as an incubator for emerging artists. Flynndog Station, the latest addition to the clan, features three semiprivate studios — an alcove with windows that overlook the common space and two offices enclosed by partial walls — as well as an open gallery for gatherings, rehearsals and public events. While the studios aren't meant solely for musicians, there is a designated storage area for instruments and sound equipment. With its white walls, exposed ducts and orange columns, the place practically screams "art space"; the previous tenant was a commercial photographer. The Station isn't physically connected to the other two Flynndog spaces — it's located in the building next door, through the first entrance on the left if you're in the parking lot, then down a flight of stairs — but Coleman hopes to unify all three venues through art openings and coordinated events. Ultimately, she wants to let the Station's future tenants determine how the space evolves. "We're doing this on a tight budget with no major donors, so the hope is that the creative community decides they want to be a part of it and have a say in what it becomes," said Coleman. So far, the Station has wooed two local artists: blues musician Al Moore, who's leasing one of the studios, and longtime folk-rock scenester Peg Tassey, who plans to use the space for weekly acoustic voice and guitar rehearsals through the end of May. To the extent that it's possible for nonhuman entities to exhibit birth-order tendencies, the Station has a youngest-child vibe. For one thing, it's literally underground. For another, the kickoff reception on April 11 featured digital projections reminiscent of early-aughts Windows Media Player visualizations set to music of a genre that could be vaguely identified as goth. Advancing this general aesthetic was Cassidy Sargent, Art Shape Mammoth-slash-Flynndog's twentysomething event coordinator, who presided over the entrance that evening clad entirely in black. A pair of bronze bird skulls dangled from her earlobes. "I definitely see Flynndog Station as a space for younger artists, but our goal is to bring the whole artistic community together," said Sargent. "I would love to see this become an underground music venue, but Margaret wants it to be a multigenerational space. So we have slightly different visions, but that's not to say that those things can't work together." Given the strong interest from the musician and performing artist crowd (not to mention being neighbors), Sargent said that she and Coleman plan to have the room soundproofed in the near future. In the meantime, they're still looking for residents of any stripe to fill the remaining private-ish studios or rent the common space for rehearsals, workshops, whatever. "This would be a great spot for open mic nights, or film screenings, or giant floor installations," suggested Coleman. "I can imagine, like, a life-size cave sculpture right there that people can walk into. This place just has so much potential." She glanced around the common area, where a thickening crowd took in the waveform projections on the blank white wall, and added, "I think we should also probably get a couch." The original print version of this article was headlined "New Trick for Flynndog: A Station"